HP has integrated and updated the Task Sequence Editor as the following when you select one of the HP custom actions. The HP custom settings contain the following controls. This list displays the available HP configuration. It represents the types of major activities used by to configure ProLiant servers, such as configuring the BIOS, array controller, iLO and boot order. 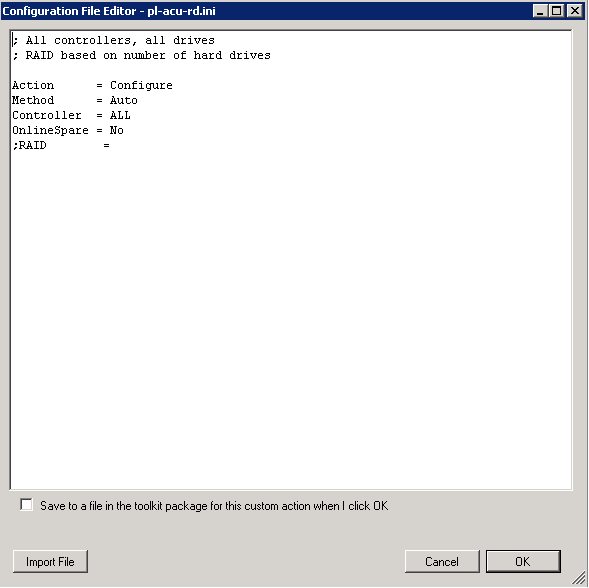 Details of the HP Configuration Actions are described in HP Custom Configuration Actions. This list displays the available options for the selection configuration action type, which is either Get or Set, or both. With each configuration type, you can apply a configuration to the targeted machine ("Set") or you can capture a configuration from a reference machine ("Get") using a single task step. Some configuration types enable only one option, and in that instance, only one is available to select. Once you select an available action, additional controls become visible and/or enabled. the utility requires a configuration file, the list contains a list of sample files included with the installation, in addition to any other files you place in the same directory. When you select one of the files, the View button appears to the right of the list. When you click the button, the text editor appears, displaying the contents of the file. the utility requires a configuration file that is text or XML formatted, the list contains two options at the top: "<Create configuration file>" and "<Import configuration file>"
If "<Create configuration file>" is selected, the "Create" button appears to the right of the list. When you click the button, the text editor / Array Builder dialog appears with no contents, enabling you to create a configuration file from scratch. If "<Import configuration file>" is selected, the "Import" button appears to the right of the list. When you click the button, a file selector appears, enabling you to select a file that will be imported into the text editor / Array Builder. For more about using the text editor, see "Using the Text Editor." For more about using the Array Builder, see "Using the Array Builder." The utility requires a command line, the control is appears as a text box, enabling you to enter the appropriate command line. If a configuration is being applied ("Get"), the control appears as a text box where you can enter either a filename into which the captured information is saved or an appropriate set of command line parameters for the command. NOTE: Selecting a "Get" action enables and causes the Mapped Drive and Log File Path controls to be enabled and required so you can select the drive letter of a network share that has been mapped to a drive on the client machine in addition to an optional path within that mapped drive. This checkbox enables or disables the Additional Command Line control. It is checked manually by you or can be checked (and optionally not-modifiable) programmatically based on the requirements of the selected configuration type. Some configuration types might not require additional command line parameters. In this instance, the checkbox does not appear. This checkbox controls the use of the timeout value control. If checked, the timeout value control is enabled and you can specify an integer value (limit to between 5 and 100) for the timeout value. The task is marked as failed if the status is not returned within the timeout value. Actions to take for uninitialized and null variables include the following. When you need a variable that is not initialized or has a blank value to remain blank, you must select this option. This causes the processing of the task on the clients side to continue if any variable is undefined or blank. In some instances, if variables are intended to be replaced but are not found within the environment, the action is left in an unusable or misconfigured state. If an environment variable is not set or is set to null, an invalid value is returned. When this checkbox is selected, any failure to retrieve a valid variable value results in the action being marked as failed. This feature enables you to see what is wrong with the action rather than trying to debug a failed command line or a misconfigured system. This setting enables the client-side script to search for and replace variables in the command line or within the files specified. The variables are replaced with values found in the task sequence environment or the Windows® system environment. If you do not have any variables in the command line or in files specified, leaving this checkbox unchecked provides for greater performance of the action since it does not have to search for the variables in every file. In some instances, configuring a hardware component requires the use of a password. Rather than embedding the password in plain text within the XML or visible on the command line, you can utilize this option to store the password hidden from you and used within the action on the client as a task sequence variable. Checking this box enables the two password textboxes. Two textboxes are used to ensure you confirm the password entered since the password text does not appear. You might have to set additional variables on the system prior to a task running. This might be because the utility or script being run needs to have specific variables defined to direct it to a specific path, other utilities, or to define options for program execution. This data grid enables you to define an unlimited number of additional variables for this task, which is set prior to the start of the command that runs the associated utility. Each variable must have a name, but the value can remain empty if you need to create a null variable. Each variable can be set as a system, task sequence, or machine variable. To remove a variable, click the X button on the appropriate row. A variable's value can contain another variable. This is useful in the instance that an existing variable holds the value you need, but the program needs to access that information from a different variable name. The settings on the Log/Return Files tab relate to files that are returned to the site system after the task runs, including either log files or captured configuration files, or both. When a task sequence runs, Configuration Manager tracks and logs command execution through the SMSTS.LOG file stored in the local path on the client (for example, on the X: drive in WinPE). This log file contains valuable debugging information, yet when using WinPE, the log is lost at each reboot. 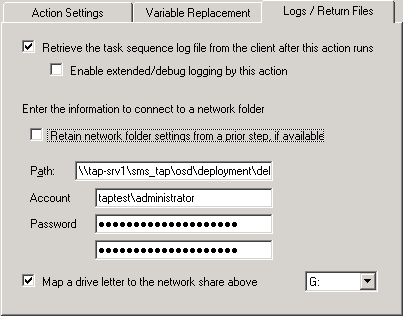 This checkbox enables the SMSTS.LOG file to be sent back to a designated location specified previously in a "Connect to Network Drive" action. After the command executes, the client gathers the SMSTS.LOG file and pushes it back to the mapped network location specified in the Drive Letter list and the Path textbox. If the path does not exist, it is created before the log file is placed there. If a filename is specified in the path, the SMSTS.LOG file is saved as that file. If the file already exists, the file name is modified with an incremental value and then saved. By default, a limited amount of information regarding the task execution by the script appears in the SMSTS.LOG file. By enabling debug-level logging, a much greater amount of information is included in the log file, which might assist with troubleshooting a failure in the task sequence. This setting only affects the logging by the custom action script and not the logging by the task sequence client itself. For information about logging debug information about the Admin UI components of the custom action, see the Debugging UI Issues section in the troubleshooting assistant. If you have an extensive task sequence with many of these custom actions, rather than require you to enter the same network path and login information in each task step, this checkbox enables you to copy the settings from a previous step that sets these network settings. NOTE: Since network settings are not retained across a reboot, checking the box only copies the settings from a prior task if there are no reboots between them. If there is a reboot after the previous task with network settings and before this task, an error message displays and you are required to re-enter the network settings. The log path enables the log file to be stored in a location other than the root directory of the mapped drive. If a path is specified, the log is stored there. If the directory does not exist, it is created if possible. If a filename is specified at the end of the path, the log file is saved as that file name. If the file name already exists, then an incremental value is added to the name so the file can be saved without overwriting an existing file. The domain and account name to be used to access the above path. The password associated with the account name. The password is stored and transmitted in encrypted form. The map a drive checkbox enables the list for mapping a drive. A mapped drive is not necessary to store files on a network share (a UNC path can be used), but HP recommends mapping a drive. A mapped drive is required for accessing any batch files (.CMD or .BAT). The mapped drive list contains drive letters that are used to store the log file or the captured settings file from the Get action. This drive needs to already have been mapped using a Connect to Network Folder action prior to this task step. When you click the View button, the Configuration Text Editor screen appears. The Import File Button menu item enables you to search for and import an existing text-based file. The contents appear in the form. By selecting the Save to Package checkbox, the configuration is exported to a file when you click OK on the page. The starting directory is the package directory where the other toolkit configuration files exist. The package must be updated to distribution points before any changes are available to task sequences. If you do not choose to save the configuration to the package, the configuration is saved as a string within the task sequence and sent as a variable to the target server during deployment. When this occurs, it is noted in the custom action with the configuration parameter text "[Configuration saved as a variable]". The configuration can be saved as a file in the package instead by re-opening the editor, checking the box on the left and clicking OK, and then selecting the file to save. 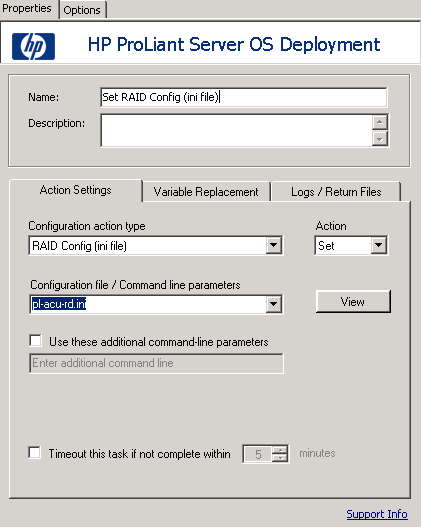 Array Builder is only available if RAID Config (wizard) is selected as the Configuration Action Type. The Array Builder is a tool that enables you to define rules for configuring array controllers in target servers based on several variable factors. You can configure the storage array using a rule, without having to know the exact physical configuration of the array controller and disks before you start your deployment. When you run the task sequence on target server, the array configuration utility detects the existing controllers in the system as well as the disks attached to each controller. The custom action then tries to match the physical configurations it detected to the logical configurations you defined in the configuration rules. These array configuration rules are defined using a graphical, logical layout that enables you to visualize how your array controllers are configured. Rules are processed in the order they appear in the tree, so you know exactly which rules have priority. You can define rules to match configurations based on the detected slot number that the controller is in (or just the embedded controller, if any), how many disks are attached to the controller, or apply a blanket configuration to any controller it finds. 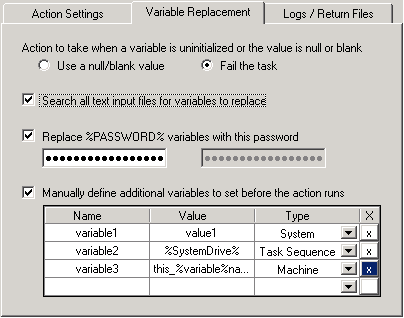 Configuration rules can also be applied based on task sequence variables detected on the system. This enables you to define different configurations to servers even if the detected hardware is identical. If you attempt to apply a very specific set of configuration rules to target servers, the configuration might fail when one of the rules does not match a controller in the system. To apply a large blanket set of rules to all servers, the configuration might fail only when none of the rules match any controller. This setting enables you to control these actions. Fail the task if any controller does not match a configuration rule?Reports a failure on the task if any of the detected controllers are not able to be configured by a rule. Fail the task only if the first controller does not match a configuration rule?Reports a failure if the first controller detected (usually the embedded controller) cannot be configured by a rule. Fail the task only if none of the array controllers match a configuration rule?Reports a failure only if all of the controllers in the system fail to match a rule, leaving none configured. The following is the definition of the rules associated with the different elements in the dialog. The rules define what actions can or cannot be performed on the various elements, which in turn drives the activation or deactivation of the various controls (menu buttons) on the dialog or results in warnings. For example, if moving an array upward in the list causes an invalid configuration, the "Move Up" control is disabled or a warning dialog appears. When launching the Array Builder from a <Create configuration file> selection in the deployment action, a default controller is created. You can choose to leave the controller unconfigured with disks set to non-RAID, or you can add arrays or do other actions. When a controller node is selected, the Edit Controller enables you to change the configuration of the controller. Array nodes include both RAID arrays and non-RAID disk groups (indicated by "Non-RAID disks" and the different array icon). By default, a non-RAID disk group is created when a controller is created. If the controller configuration specifies a number of disks required, that many disks is added to the non-RAID group. Arrays can be added, modified or deleted depending on the controller configuration and number of disks available. Array elements contain logical drives and physical disks. This control enables the addition of another array to the controller under the same variable condition. Adding an array also adds a default number of disks to meet the requirements of the array. For example, adding a RAID 5 array adds three disks automatically. You are not enabled to remove disks below the RAID requirement. Some arrays (RAID 1) require an even number of disks in the array. In these instances, you cannot create a situation where an odd number of disks exist. For example, if you add a disk to a two-disk RAID 1 set, the program adds another disk to ensure there is an even number. If you delete a disk, the program deletes two disks. Status messages inform you of these actions as appropriate. This control currently supports only RAID 0, 1 and 5. Arrays can be edited from one RAID type to another. For example, you can decide to configure the controller with a RAID 5 array instead of a RAID 1 array by changing the array type. Changing the array results in an evaluation of disk requirements. If the array does not contain enough disks to meet the RAID requirement, the appropriate number of disks are added and you are notified of the action. If the new RAID level requires fewer disks, no disks will be removed. If the controller defines an exact number of disks and you attempt to change an array and the new array requires more disks than the existing array, the program attempts to move disks from the Non-RAID disks set to the new array. If there are not enough disks in the non-RAID set, you are prevented from changing the array. If you change an array to a type that requires an even number of disks, another disk is added or removed if necessary to meet that requirement. Changing from one array type to the same array type is disabled on the menu. You cannot delete the "Non-RAID disks" node. This control deletes an array and results in the deletion of all disks in that array, except where the controller defines an exact number of disks. The program moves the array disks to the Non-RAID disks set. This control enables the creation of a new logical drive in addition to the default logical drive. Enables addition of one or more new disks to the array. You can add a single disk, multiple disks at once, a hot spare disk, a hot spare assigned to the last drive on the controller, or "all remaining disks." For the complete rules information, see the disks section below. If the controller defines an exact number of disks, the New Disk button is disabled. If the array or the controller already contains an "all remaining disks" element, this option is disabled on the New Disk menu. Array names (such as "A" and "B") are modified so that the arrays are listed in alphabetical order. Disks are renumbered so that disks are listed in order on the controller. This also enables you to specify which disks are used in which array by re-ordering the arrays on the controller. The "Non-RAID Disks" node is always listed last. Logical drives are contains arrays or non-RAID disks node that are configured to a specific size (in GB) and consumes all available and remaining space in the array. By default, a single logical drive is created for all new arrays, and set to consume all available space. When specific-size logical drives are defined, the "using all remaining space" logical drive consumes any leftover space after the other logical drives have allocated their space on the array. When you create a new logical drive, it is placed before the default "using all remaining space" logical drive if one exists. You can modify the settings of the currently-selected logical drive, including changing the allocated size, or change it from maximum size to a specified size, or vice versa. If a logical drive using all remaining space already exists, you cannot change another logical drive to that type. This control removes the selected logical drive. You cannot remove the last remaining logical drive. Moving logical drives cause logical drive numbers to be modified so that the logical drives are listed in numerical order. The "using all remaining space" node is always listed last. Standard disks - These disks are basic and non-defined disks that make up the storage on arrays. All Remaining Disks - When you want to define an array without specifying exactly how many disks are in it, you use this form. For example, when you want a RAID 1 set as the first two disks, and the rest (an unknown number between 1 and 6) can be utilized in the best manner possible. In this instance, you must define the RAID 1 array, and then create a dynamic array containing the "All Remaining Disks" element. If the controller configuration specifies a number of disks required, that many disks is added to the non-RAID group. If the controller specifies an exact quantity, disks cannot be added or removed from the controller. They can only be moved from array to array (or the non-RAID group). If the controller specifies a minimum number of disks, disks can be added and removed, but you cannot remove disks beyond the lower limit of the controller configuration. You can add as many new disks as you need to any configuration except where an exact number of disks is specified. In that instance, the "New Disk" menu item is disabled. If an "all remaining disks" element exists in the array or on the controller, that menu selection is disabled. If deleting a disk invalidates an array or a controller configuration, a warning dialog appears and the deletion is disallowed. If you are deleting an "all remaining disks" node, and there are not enough disks left in the array, you must add disks before they can delete the "all remaining disks" node. This control is only applicable if you are moving the hot spare disks among the standard disks. This menu item enables you to search for and import an existing Array Builder XML file. The XML file must be properly formatted. This menu item enables you to save the current configuration to an XML file in any location you wish. This configuration file is used and saved into the package, unless you choose to save to a variable instead (see below). 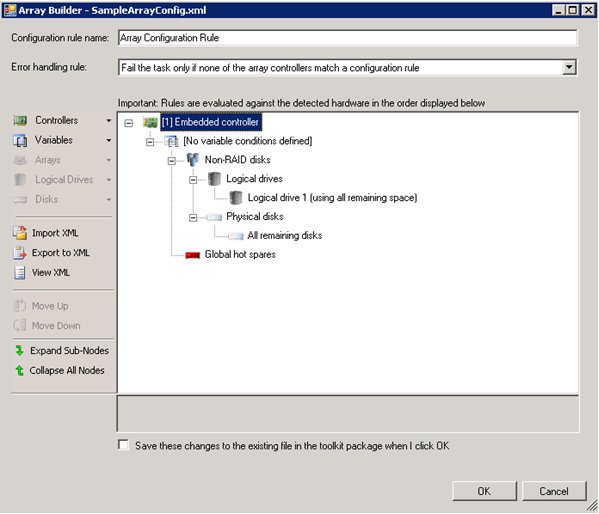 This selection is also enabled if you create a new configuration or when you make a change to an imported configuration. This menu item enables you to view the current array configuration rules in XML form as they are sent to the server being configured. By selecting this checkbox, the configuration is exported to a file when you click OK on the page. This is menu item is similar to the export feature, except that the starting directory is the package directory where the other toolkit configuration files exist. This enables you to create new configurations that can then be propagated to the rest of the company. If you do not choose to save the configuration to the package, the configuration is saved as an XML string within the task sequence and sent as a variable to the client during deployment. When this occurs, it is noted in the task UI with the configuration parameter text "[Configuration saved as a variable]". The configuration can be saved as a file in the package instead by opening the Array Builder again, checking the box on the left and clicking OK, then selecting the file to save to.